Sunflowers are known for making you smile and they have a way of brightening up any room. Perhaps it&apos;s their bright colours, large petals, or even the way the flower itself is quite similar to the sun. Whether you are celebrating a birthday, the arrival of a new baby, or perhaps you would like to help a sick friend feel better, sunflowers are always an excellent choice! 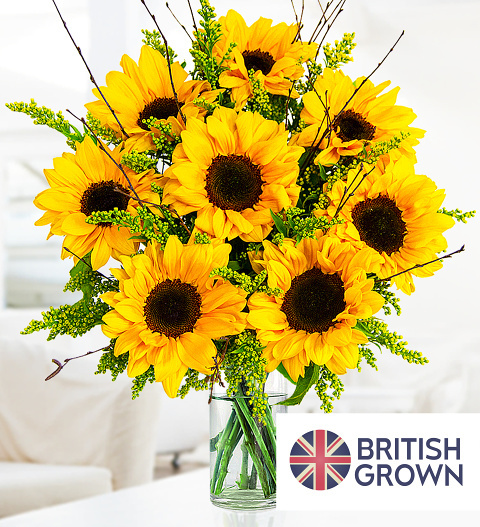 Available for UK next day delivery, our professional team has chosen to accompany this bright bunch of British grown sunflowers with solidago for added colour, texture, and fullness.